2 bedrooms, 3 bathrooms, sleeps 8. Copper Junction is one of the best locations at Copper Mountain! 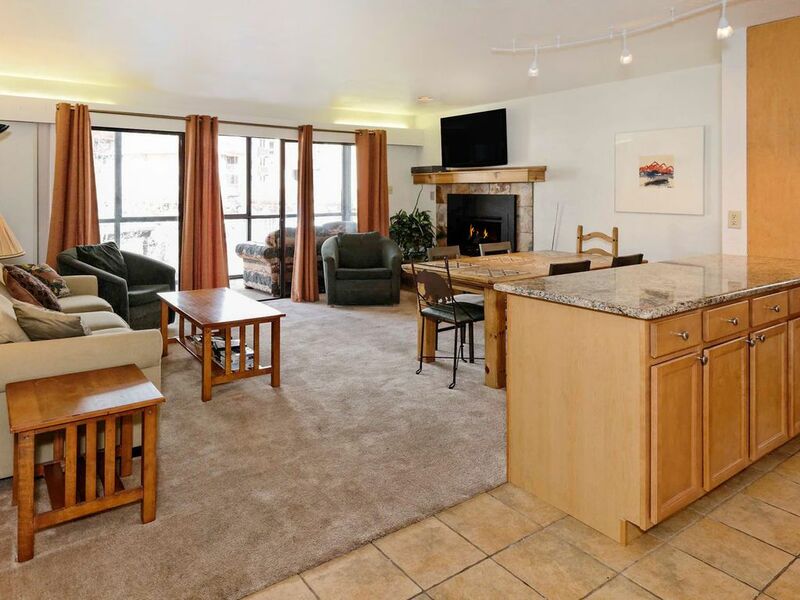 This true ski-in/ski-out condo is just steps from the American Eagle and Flyer lifts. It is a corner unit, and boasts expansive views of the ski mountain to the north and sunset vistas to the west. This condo has a full kitchen, mountain view and it sleeps 8 people! A fraction of the cost of 2 hotel rooms and you have a kitchen, so you'll save on meals too! Enjoy the freshly remodeled kitchen, complete with granite counter tops, tile flooring, and open kitchen/dining area. We added a huge flat screen TV with DVD player, gas fireplace, and new furniture. You can sleep 8 people comfortably in this condo, for a set nightly rate. Two in the master bedroom, four in the second bedroom and two in the sofa bed. But, please note that if you're looking for luxury or premium accommodations, Copper Junction is not the condo for you. The building was built in 1973 and has not changed much since. But, if you're looking for a convenient and roomy home for your fully-charged ski vacation, you'll love this unit. Most of our guests love the condo and its location - we have many repeat customers. But those of you who are happiest in upscale, luxury accommodations, then please check out the Cirque or the Cache! Compare this 1057 square foot condo with other 2-bedroom condos and you'll see that you get lots more space for your money. The bedrooms are bigger than most of the newer condo bedrooms, each with its own bathroom. For extra convenience, there is a third bathroom in the hallway. In the master bedroom there is a king bed and a glass-enclosed balcony. The second bedroom has two queen beds, and there is a sleeper-sofa in the living room. Our condo offers a fully-equipped kitchen and two patio/balconies with amazing views of the ski mountain and Copper's Burning Stones Plaza in the center village. It's a great location for all seasons, with easy access to the slopes in the winter. The rest of the year, from the comfort of the balcony, enjoy Sunsation, Copper Country, Yarmony Fest and all the impressive live music lineups. Copper Junction was built in 1973, so it has the large floorplan. And it's been partially remodeled, so it offers the best of both worlds - lots of room and some updates. Don't forget that this location can't be beat! The living and dining area is open, bright and spacious compared to many of the newer units at Copper. Modern updates include granite countertops, huge flat screen TV w/DVD player, TV's in each bedroom, new sofa-bed, kitchen table and chairs, new bedding, free wireless internet, a ski locker room on the ground level slopeside and a gas fireplace. The resort shuttle stops are right in front of the Copper Junction building. These buses take you to all resort destinations. Take a quick 5 minute walk, or 1 minute shuttle ride to the athletic club where you'll find a heated pool, hot tubs, steam room, sauna, weight room and cardio machines. Copper Mountain is located in the heart of Colorado ski country. Vail, Breckenridge, and Keystone are all 20 minutes away. Arapahoe Basin and Loveland are just 25 minutes away. Beaver Creek and Ski Cooper are 30 minutes away. And Winter Park, Steamboat Springs and Monarch are only 90 minutes away. You'll be surprised at how convenient it is to get to Copper Mountain Resort, a world-class skiing and riding mecca. Copper Junction is smack in the middle of Copper's Center Village - the best place to be at Copper! You'll soak in the unobstructed view of Copper Mountain from the glass enclosed sun room. Yep. You can ski right to the patio of Copper Junction, where there's a heated and secure ski locker room. Grab your gear from your own ski locker on the ground level of Copper Junction, gear up and GO! The laundry room is located on the ground level. Take the elevator from the underground parking garage to the 2nd floor. Also provided: microwave, toaster, coffee maker, mixer and can opener. New HD flat screen TV in the living room. A small collection of popular titles. World-class skiing and riding just outside your door! This is a true ski-in, ski-out building. There is no hot tub or pool at this building, but the Copper Mountain athletic club is less than a block away and is $12 per day for adults and $6 per day for kids ages 6 - 17. Kids 5 and under are free. Punch passes are also available at a discounted rate. The athletic club offers a pool, hot tubs, steam rooms, saunas, free weights, weight machines, a spa and more. Location could not be better ! Great for the family and we hope to be able to return next year! Very nice condo very convenient to slopes. Condo met our expectations quite building and very convenient to main plaza and slopes. Description was very accurate and met our expectations. Would definitely do it again. We recently chose Copper Mountain for our annual family ski weekend and were very satisfied. The description and photos accurately represented the property. We would not recommend this property to people who require modern or high-end, as this unit is only somewhat updated (kitchen, countertops and a few furnishings), but would definitely suggest it to families wanting a convenient location and good value for the size for a full-on ski vacation. This is an older place, but we gave it 5-stars because everything was disclosed accurately, it was maintained nicely and clean. And the customer service from the manager was great. We especially appreciated the well-equipped and upgraded kitchen, cozy and comfortable living area and ample household supplies which made it convenient for us. The fireplace was easy to ignite and cranked out the heat. We especially appreciated the hairdryers, games, movies and warm balcony to people watch. We're already looking forward to a return ski visit. We had a nice time with family and appreciated the excellent location of this property. It was advertised accurately and we were attracted to the fair price for this size of a condo in prime location. We found it to be clean and well-maintained for an older building. We slept well in the beds. Thank you for the lotions as our skin was very dry! I loved sitting on the porch and people-watching. Thank you for a nice stay! And I'm sorry I took the parking pass which I have mailed back to you. Nice condo with an unbeatable location overlooking American Eagle Lift. It was so nice not having to carry our ski gear a distance to get to the lifts. Great for families with young kids. The enclosed porch was perfect for sitting outside and watching the action of center village, while staying warm. Could use some more/new kitchen pots and cutlery. Very responsive to questions. We would stay here again in the future! We had a great stay in this condo. It was clean and just as advertised, not fancy but provided what we needed. Best of all, we didn't have to lug our stuff to the ski lift because it was literally right outside the condo. All was great, thanks! Copper Mountain is a world-class ski resort located in Summit County, Colorado, USA.